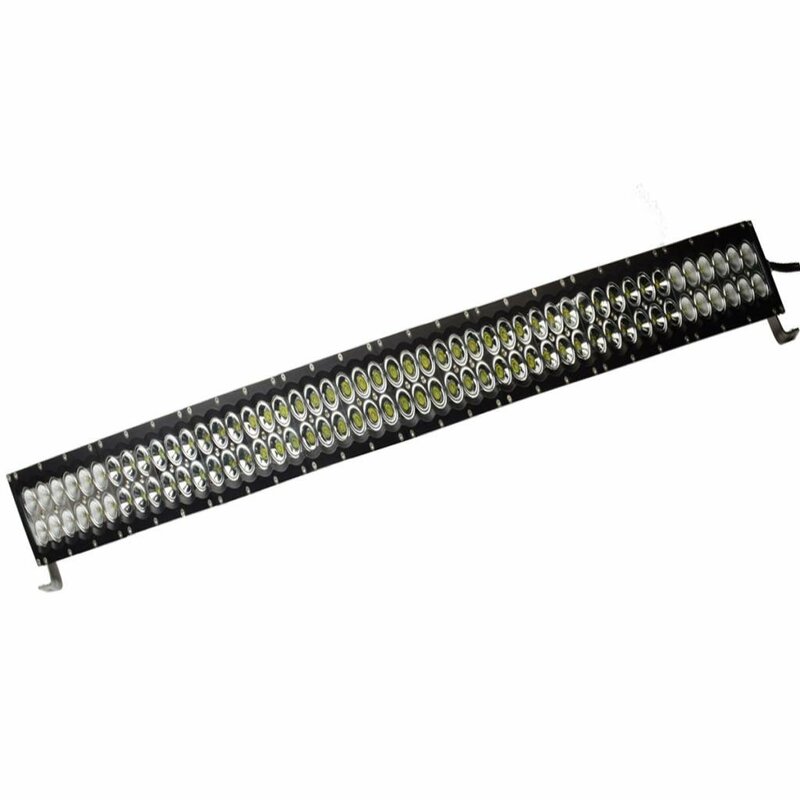 If you are considering a 48-inch LED light bar, it is probably because a 50-incher is just a bit too wide for your vehicle or other application. Do not worry, however, as the light output difference compared to a similar layout bar two inches longer is nearly imperceptible. In this section, we have some gems including a “regular” single-row bar, a dual-row economy bar and a special one-row bar with dual-row luminosity. 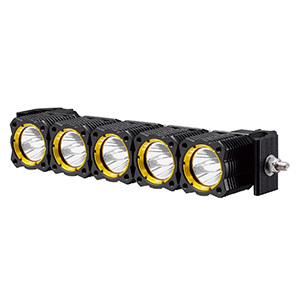 Generic has a real competitor in the longer light bar lengths with this single-row luminosity monster that uses 48 5W high-output CREE LEDs to light the way ahead. These are 67 percent brighter than the usual 3W LEDs other light bar makers use. This makes this slim bar very competitive with dual-row bars of the same length. It comes with end brackets and a wiring pigtail only. Generic, we think 26,000 raw lumens is a questionable claim. 20,000 is more like it but there is no question that this is a retina-scorcher of a light bar. Other than that dubious spec, it is an impressively rugged light with an excellent cooling design for those big CREEs. The flood/spot combo imparts a nice beam spread with plenty of depth. 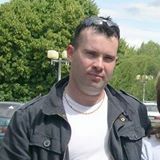 This is a new company, so there are not yet many reviews to go by, so ask lots of questions before the purchase. For under $140, this 48″ light bar definitely wins on a lumens per dollar basis with its 5W CREE LEDs. The build quality is average with a better cooling design and and IP67 waterproof rating. 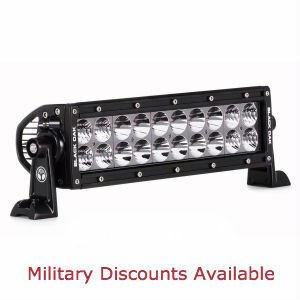 Its price point makes this a very economical starter or auxiliary light bar. This Eyourlife LED light bar is phenomenally bright thanks to 96 intensely brilliant CREE LEDs and efficient reflectors. It has a gentle curve along its length that adds a bit of panache plus a widening of the beam overall. It features an IP69 intrusion rating, which is two step above most competitors. It also boasts a couple of unique features not found on any other light, which are four outer color filters, a rubber cover and a remote control. 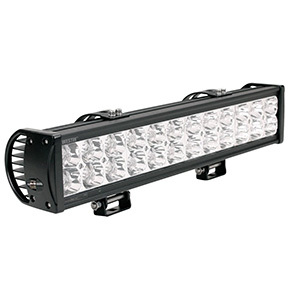 This light bar is amazingly bright with a curve that yields a smooth meld between flood and spot sections, which use 25/75 percent of the full bar, respectively. This is the only 48-inch light bar we review with a remote control. Its functions are on, dim or strobe. That is probably not an in-demand feature for trail riders, but it is a nice touch for public service vehicles. You can also use its Android app via a Bluetooth connection. 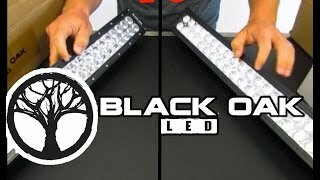 This is another innovative but economical LED light bar from Eyourlife. The design fundamentals including bright and plentiful CREE LEDs, IP69 intrusion rating, a curved housing and ample cooling are all there. Those alone make this an excellent light bar value with the remote, filters and cover adding icing on the cake. 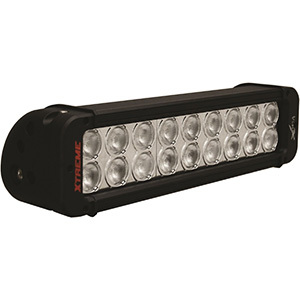 Rogue is bringing its own brand of innovation to the LED light bar game with a line of slim, single-row light bars that utilize 10W American made CREE™ LEDs for maximum brightness in a small package. Their 48″ LED light lines up 26 of these high-output LEDs to provide a breathtakingly bright beam in a low, sleek profile. All light is projected forward as an intense, deeply penetrating spot light. It is waterproof, dustproof, tough and ready to play. Rogue’s 48-inch light bar is lightweight and comes with three sliding channel mounts so it is a breeze to mount wherever you like. It boasts an IP67 intrusion rating plus a special aluminum plate that gives extra protection against branches and rocks to the already tough polycarbonate lens. Amazingly, it puts out more light than other dual-row light bars in this length and all in a spot beam. Thus, you get the longest reach of any 48-incher on the market. With Rogue, you pay a bit more than for imported light bars, but for looks, ruggedness and performance this is an LED light bar hard to beat. Given that their 48-inch light bar puts out almost twice the luminosity of many longer dual-row lights, it represents a superb value that will not disappoint. This section had a little of everything for those buyers looking for a full-length LED light bar with high performance features in a range of prices. From the Macusa single-row, 5W CREE LED model to Eyourlife’s nearly gaudy, dual-row, colored and remotely controlled bar to Rogue’s higher quality, insanely bright one-row design with top-bin 10W CREEs, there is something for everyone. 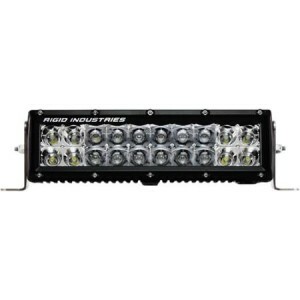 At 48 inches, you are looking at some of the brightest light bars in the industry that truly turn night into day for a wide variety of work and play applications.